The Next Right Thing Go, Charlotte! I read an entire (library) book over the long weekend, which was wonderful in itself. The book made a big impression on me, and at times left me feeling pretty low. It’s a story you may be familiar with, but I hadn’t heard it before and can’t remember now how I found out about it. I even have a feeling someone reading the blog suggested it. The book is called Breaking Night: A Memoir of Forgiveness, Survival and My Journey From Homeless to Harvard. It’s written by a young woman named Liz Murray who grew up in the Bronx with two drug-addicted parents. From the age of four she watched her parents shoot up in their squalid apartment, waited anxiously for them to come home from scoring drugs, and survived on bread with mayonnaise as they blew their monthly welfare check in a few days of bingeing and left the cupboards bare. Liz stopped going to school and evaded caseworkers with tenacity and creativity. By the time she was fifteen she was living on her own, carrying everything she owned in a backpack and surviving on what food she could beg from friends, or steal. The story has an uplifting ending. This remarkable young woman has not only come to terms with her childhood, forgiven her parents, and made much of herself but now devotes her life to helping others realize their potential regardless of their circumstances. One of the things that struck me most about Liz’s story was how invisible she was. For years she slept in stairwells or subways at night or in friends’ empty apartments during the day while their parents were at work. After a stint in “placement” she was terrified of being sent back into the system so never let on how dire her circumstances really were. I was out for a walk along Broadway today and saw a young woman sitting on a corner. She was wearing filthy clothes and had a kerchief around her head and a dirty blanket around her shoulders. In her lap was a cardboard sign that said “Please help. $18 will get me a room at the Joyce.” I thought of the book, and of all the people who looked the other way while Liz Murray endured stunning neglect and thieved her way through her American childhood. A hallway at the Joyce Hotel. 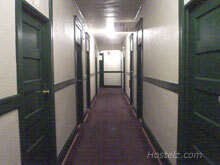 Photo from hostelz.com, a hostel review site. Reviews of the Joyce are not for the faint of heart. There was a dog curled on an old sleeping bag a few yards away, a bag of kibble propped up nearby. I smiled at the young woman and said hello but kept walking, unsure. After a few steps I turned around. The woman spoke. “She’s okay, if you’re worried about the dog. She won’t hurt you.” I went back and stood near the woman. Her green eyes were clear, her face marked by fatigue. Her straight white teeth hinted at the fact that maybe, at some point, someone had cared about her. Her name was Carrie. We started to talk and she told me she’d been living on the streets for about a year, ever since she lost her job at a residential treatment center in Yakima. She grew up in Portland so, jobless, she headed back towards home. Her car died during the trip and she arrived penniless. Usually she sleeps under a bridge, but occasionally she collects enough coins to pay for a night in a four bed “hostel” room at the Joyce Hotel. She shivered under her blanket. The paper cup held some pennies and other coins. It seems pretty cheeky in retrospect, but I asked her if she was using and I believed her when she proudly said she’d been clean for four years. I reached into my pocket for the C-note I’d tucked in there earlier. “I don’t want to put this in your cup.” I said. “Here.” I held out the folded bill and she wrapped her hand around it and pulled it onto her lap. “Thanks a lot,” she said, smiling at me. A few seconds passed. “Did you look at it?” I asked her. “No,” she said and opened her hand just a speck, hiding it with her sign. She gave me a big hug and then I wasn’t really sure what to say. I told her I was very sorry for what she was going through and to take care of herself. “And,” I added, “remember that there’s goodness and kindness in the world.” With a mildly hopeful smile, she said she would. 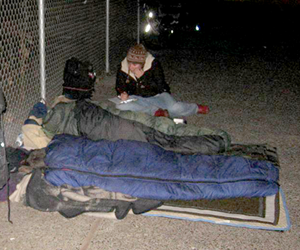 Portland has the highest proportion of homeless in the nation. This photo is from commonground.org. Earlier tonight I took the garbage out, including the remains of our Thanksgiving feast and a discarded pair of shoes no longer comfortable. Empty wine bottles from our festivities fill the recycling bin. I got chilled in the few minutes it took me to empty the trash into the bins and roll them to the curb. I came in to a warm house smelling of fresh-baked cookies. How can I forget, even for a moment, that I am profoundly and deeply blessed? But I do. What a wonderful post from you!! Yes, it does make us thankful for what we have…and most of it is excess….we must be grateful for even the bones left from the turkey, which our grandmothers would have not wasted…they would have boiled them and made soup…and I dont do that….it makes me pause and be thankful…. There is a man that walks around Tualatin. I only started seeing him a few months ago. I don’t know his name… yet. I dubbed him, “Mike” in my mind. I knew a Mike in junior high that looks like him. Anyway, it’s been so cold and I’ve wanted to do something. I’ve knit him a very warm hat. I hope I see him again soon so I can give it to him… and ask him his name. Thanks for continuing to do what you do and share the journey with us. Did you find him and give him the hat? So sweet! so prone to sag at this holiday season. It’s all a matter of perception! Yes, we are so blessed. Thank you for the story of Carrie, and I will read that book. Sometimes I shy away from the homeless because I am afraid of their pain. A young man who rides the bus with me, long dreadlocks and the same clothes every day, got on last week with crutches. I asked him what happened to his leg; it was burned from a fire inside his tent. In the incredibly cold weather we have had, he was in a tent! I’ve watched for him hoping he is okay. I have such a problem with the magnitude of the suffering during this economic downturn. Thanks, DJan! Yes, it is painful to live in the world sometimes. I try to remember a wonderful Jewish teaching that says: “although we are not obliged to complete the task, neither are we free to desist from it.” So, we must keep trying to make the world better even though we can’t fix it. Thank you again for making me realize how lucky I am. I have a warm place to live and enough food to eat. People that love me too. It’s so easy to take these things for granted. UP, even though I have food and shelter and all the necessities. NOT luxuries, mind you, but to many others, YES, luxuries. The Terroristplot disturbed me mightily. I try SO hard to light my little corner of the world with love and compassion, and yet there are those who would destroy us all… for what good reason?! Your stories inspire me to continue my small efforts; they inspire me, they give me much to smile about, and they are TRULY one of my greatest blessings in this Holiday season… MANY THANKS, JILL! Yes, we are all guilty of forgetting to be grateful for what we have. I am so afraid for everyday people who are losing their jobs, whose unemployment benefits won’t be extended and those whose insurance will be cut off. There may be many more homeless. Wonder how Germany does do it. You gave this woman the gift of love and hope along with a warm place to stay. Why can’t millionaires do this? They need lessons from Jill G.
This reminded me of an experience I had recently outside Food Front. I was waiting for Chris outside and sitting on the bench reading, and it was really very cold – I wasn’t wearing my gloves so I could turn the pages. There is a girl that sits outside Food Front panhandling quite often and she was there that night. She is quite young and she is always very polite, every time I have seen her. She didn’t have any gloves. It took me a long time, battling my inner thoughts of judging her (she was smoking!) and my fears of having an honest conversation with her and even deeper, my thoughts around “why am I the lucky one with more than I need and she’s sitting on the sidewalk in the cold”? Finally it occurred to me that I had probably 10 pairs of gloves at home and I could only wear one at a time. So I gave her my gloves, but what I remember most is all the dark places I saw in myself before I brought myself to do it. I hope it is easier next time.